21st September, 2018 (Friday) : Check – in to our pre-booked Hotel around 12 noon (standard hotel with clean room, western toilet and AC). Have your lunch and settle down. Afternoon we will have an introduction session followed by brief classroom session on outdoor portrait shoot. We will discuss on camera settings, light, position etc. During sunset we will conduct our 1st shooting session. Overnight stay at Agra. 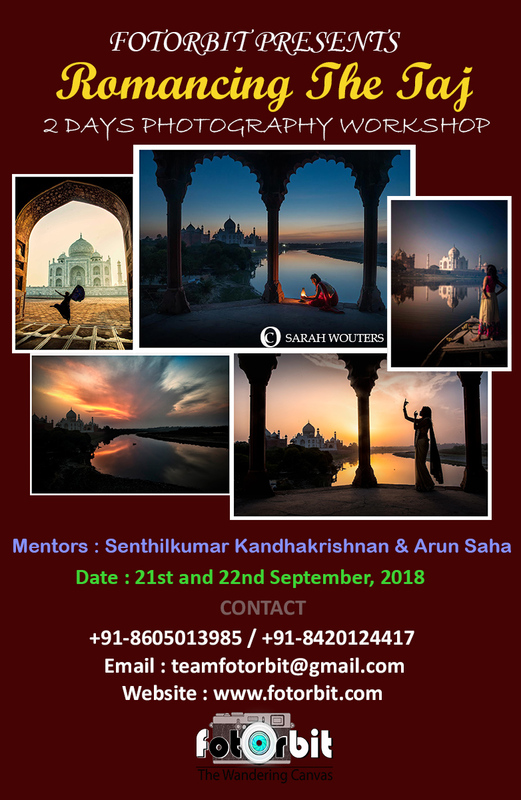 22nd September, 2018 ( Saturday) : Our 2nd session of photo shoot will start at early morning inside the Taj Mahal. 3rd and last session of model shoot will be done outside the Taj Mahal, on a boat over the river Yamuna with the Taj at the backdrop. 23rd September, 2018 ( Sunday) : After breakfast, we will pack-up and end of our workshop. It will cover your main meals (breakfast, lunch and dinner), starting from 21st September, 2018 lunch to 23rd September, 2018 breakfast. Sir Greetings from Delhi. I would like to join the work shop. What kind of equipments required. ?please suggest .And procedure to book . Hello Sir…plz contact me in this no.#8668224491 for further details n procedure. plz contact me in 8605013985 for registration.